Emmanuel Macron’s speech to the French bishops: A poisonous gift? On 9 April, French President Emmanuel Macron made a speech at the Bishops’ Conference of France, raising questions about the country’s traditional divide between Church and State. Arthur Ghins writes that the speech was an invitation to mutual trust rather than mutual suspicion, and that it should be seen as a welcome development as long as Catholics are not expected to relinquish their Catholicism. What was Macron’s intention? This question came back to me repeatedly as I read through the speech the president gave on 9 April to the French Bishops. There was a lot to please French Catholics in the speech. Throughout history, Macron says, France has been fortified by Catholics’ commitment to the common good. A big charm offensive to attract Catholic votes, then? Yes, to a certain extent. In recent years, practising Catholics in France have increasingly moved to the right. Their favourite candidate at the past presidential election was the right-wing François Fillon, and there are signs that Marine Le Pen’s Front National is drawing in a growing number of Catholic votes. Macron knows that the situation in 2017 – the socialists carrying the burden of Hollande’s disastrous reputation and Fillon’s campaign ruined by a series of scandals – will not reproduce itself. The vote of practising Catholics might be marginal (roughly 5% of the French population), but if we include non-practising Catholics in the equation, the gain for Macron’s centrist party might not be so negligible. This speech, however, was not simply about electioneering, far from it. One of its main points was to push for a liberal understanding of the concept of laïcité à la française (the French concept of secularism). State neutrality, Macron pleaded, does not amount to indifference to religiosity. He called for Catholics to get involved in politics. This is a refreshing alternative to the republican intransigence France has often displayed. But it might come with a cost, one which the galvanised Catholic audience that gave Macron a standing ovation after his speech might not have fully considered. The President has set quite clear conditions to the expression of Catholic opinions in the public debate. On immigration and ethical questions, he wants an open Catholicism, that is to say a Catholicism that “raises questions” rather than one that sets red lines and gives lessons. In other words, Macron has reached out to Catholics but he is, in a way, setting the rules of the game. I found myself wondering how Catholics could impact the public debate when the President himself has already defined what their ideal contribution should look like. What makes religious voices interesting is that they often run contrary to received wisdom. This usually does not make them popular. 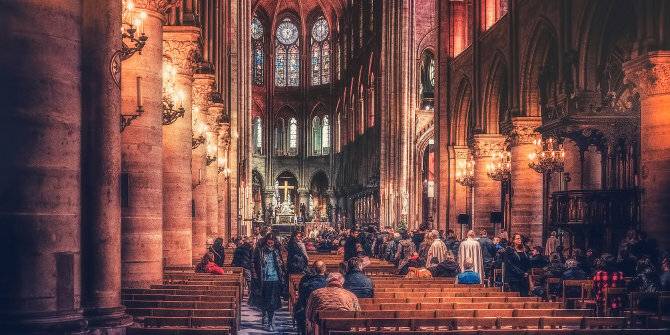 In answering Macron’s invitation to “accomplish great things together”, French Catholics will have the difficult task of showing willingness without renouncing their core principles. If they fail to reach this balance, Macron’s speech will have perhaps earned him both the Catholics’ vote and their silence. Note: This article originally appeared at the LSE’s Religion and Global Society blog. It gives the views of the author, not the position of EUROPP – European Politics and Policy or the London School of Economics. We are told: “What makes religious voices interesting is that they often run contrary to received wisdom”. That is surely not their value. Rather the received wisdom they maintain at least arguably represents basic truths that have stood the test of time, even though they run contrary to modern, fashionable even, assumptions as to what is desirable or right. Examples are attitudes to marriage, and to profligate consumption, whether or not of non-renewable resources, and inevitably the nature of the ethical teaching, if any, that children should receive in schools. Unless the State is avowedly implementing some specific religion, as France explicitly does not, while in the UK the Queen does, it must seek to treat adherents of all religions (bona fide ones at least) equally. This raises a major problem if the state feels it needs to separate core religious teachings from ancient, and arguably no longer appropriate, cultural attitudes, especially perhaps those concerning the status of women. Many Muslims and Roman Catholics will have views on that which differ widely from what many others regard as an unquestionable norm, and indeed right. The state can only resolve such different views by ensuring democratic processes are properly applied, and minority views are given due consideration. Macron, and any other government, can at best only undertake to take full, and respectful, account of what religious spokesmen have to say on any topic. He cannot undertake in advance to give effect to their views. As a PS, may I plead for the the correct use of “religiosity”, which relates to an extravagant, and impliedly hypocritical, display of piety. The comment: “State neutrality, Macron pleaded, does not amount to indifference to religiosity” makes no sense. The State should be totally indifferent to religiosity: it should however pay all due attention to religious teachings.